JAKARTA, Indonesia, September 28, 2011 (ENS) – Conserving key Indonesian rainforests inhabited by organutans could generate revenues three times greater than clearcutting them for palm oil plantations, finds a new report requested by the Indonesian government from the UN Environment Programme, under its Great Apes Survival Partnership, GRASP. At the same time, forest conservation would help to ensure survival of Critically Endangered orangutans on the island of Sumatra. 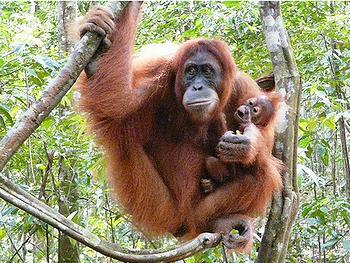 The report warns that orangutan populations in some parts of Sumatra could disappear as early as 2015. Fewer than 6,600 Sumatran orangutans exist in the wild today, down from an estimated 85,000 in 1900. If this rate of decline continues, the Sumatran orangutan could become the first of the great apes living today to go extinct in the wild. Currently close to 18 percent of greenhouse gas emissions are linked with land use change, mainly through forest loss. In 2004, this amounted to greenhouse gas emissions greater than those of the global transport sector. Under the UN Framework Convention on Climate Change, a new agreement is in negotiation that could make the economics of forest conservation work for the Indonesian economy, for orangutan survival, and for the global climate. Known as REDD+, the mechanism would provide payments for Reduced Emissions from Deforestation and Forest Degradation plus additional forest “activities,” with the aim of halving deforestation by 2020. The UNEP report estimates that many of the coastal, peat-rich forests of Sumatra, where dense populations of the last 6,600 orangutans survive, may be worth up to a present value of $22,000 a hectare at current carbon prices that range from $7,420 to $22,090. Cleared, the same land may generate revenues from palm oil plantations at less than $7,400 a hectare. 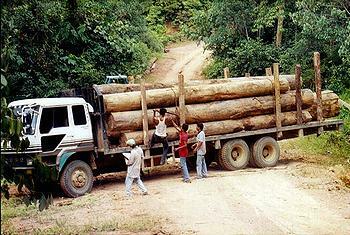 The carbon value of avoided deforestation even in ordinary forests ranges from $3,711 to $11,185 per hectare. This is much higher than the economic yield from other land-use practices such as agroforestry, sustainable logging and coffee. The report, “The Orangutan and Economics of Forest Conservation in Sumatra,” calls for more international support for REDD+ projects in key orangutan forests. Conservation organizations PanEco and YEL and the World Agroforestry Centre worked with UNEP in writing the report. With nearly 100 million hectares (386,102 square miles) of state forest, Indonesia has the world’s third largest area of tropical forest after Brazil and the Democratic Republic of Congo. But the report finds that between 2005 and 2010, forest loss in Indonesia accelerated compared to 2000-2005 and places Indonesia within the highest five countries for percentage of primary forest loss globally. The forested peatlands of Sumatra are among the most efficient carbon stores of any terrestrial ecosystem, but between 1985 and 2007, nearly half the forest on the island of Sumatra was logged – legally or illegally. 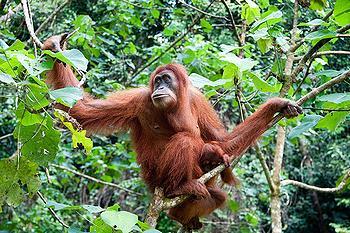 Sumatran orangutans inhabit two provinces, Aceh and North Sumatra. Aceh has experienced a total forest loss of over 22 percent from 1985 through 2009, while North Sumatra has lost over 43 percent of its forest cover during that 14-year period – with a consequent loss of orangutans. Currently, the government of Norway is supporting the government of Indonesia in its efforts to reduce deforestation and illegal logging under a $1 billion agreement that includes a two-year suspension of new concessions that convert peatlands and primary forests. Erik Solheim, Norwegian minister of the environment and international development, said his government is now providing additional support to the international police force, INTERPOL, towards enhancing collaboration among United Nations agencies and others to combat illegal logging. “We recognize that in order to make REDD+ a success, tackling illegal logging and assisting governments such as Indonesia with the capacity to combat such crime, will be important,” Solheim said. UNEP says the new report, which comes in advance of the UN climate convention meeting in Durban, South Africa in November-December, indicates opportunities for other international donors to extend REDD+ initiatives in Sumatra and in other tropically-forested regions. 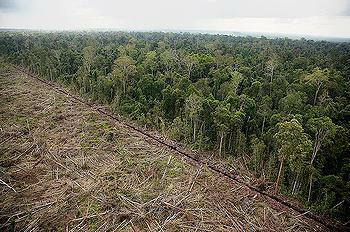 Deforestation is blamed for both flooding and water scarcity on Sumatra. Steiner said the report indicates in Aceh and in North Sumatra there has been a reported 50 percent decline in water discharges in as many as 80 percent of rivers as a result of deforestation, “losses that have serious implications for agriculture and food security including rice production and human health,” he warned. Deforestation is cited in the report as a key cause for increased flooding that has impacted over 500,000 people over the last decade. Unsustainable logging also may be linked to the over 500 fires that have impacted the Tripa swamp forests in Aceh province in the past 10 years with economic losses estimated at over $10 billion between 2000 and 2010. “The UN climate convention meeting in Durban needs to make progress on several fronts, including REDD+, as one way of keeping a global temperature to under 2 degree Celsius,” said Steiner. “In doing so it can send a strong and supportive signal to Rio+20 in June 2012 in terms of accelerating and scaling up the full range of opportunities for a sustainable 21st century,” he said.